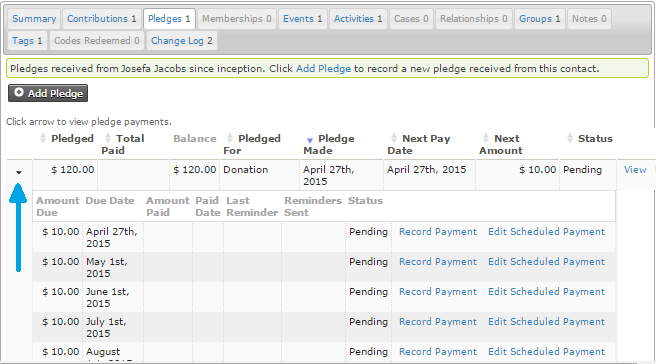 Find the next scheduled pledge payment and record the payment as paid. You can also edit the scheduled payment to alter either when the payment is due or the amount of the payment. 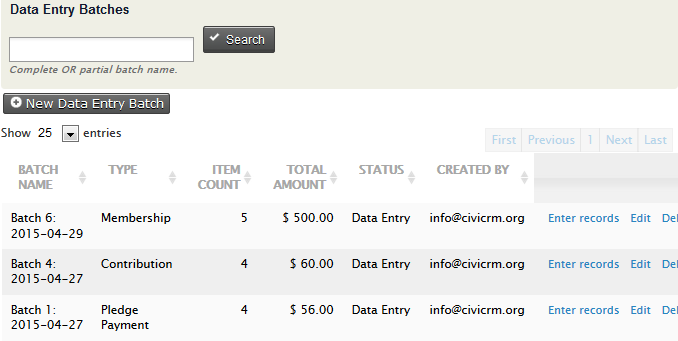 The Batch Data Entry feature speeds up data entry when you have a lot of pledge payments to record at one time. You enter payments using a grid input screen where you can use the ‘autocopy’ icons at the top of each column to quickly fill in field values. It also lets you verify the total amount and count of items in the batch against the payments recorded on your deposit slip(s). During the batch data entry you can create new contacts on the fly. You can save the batch and return later to continue entering payments. If you have the appropriate permissions, you can also edit the total amount and count of items in the definition of the batch if needed. From the menu, click on Contributions > Batch Data Entry then select New Data Entry Batch. Type: Select Pledge Payment. This selects the appropriate reserved profile to view in the batch entry grid screen. You can edit or delete Batch information by going back to the Bulk Data Entry screen then clicking on Edit or Delete next to the batch you want. Create a new contact by clicking the drop-down box for “-create new contact-“ and selecting the type of contact you want to create: New Individual, New Organization, or New Household and enter the information about the contact here. If contact information such as phone number or email address are included in the grid profile, those values will be populated for an existing contact and can be updated as needed. Open Pledges: Click on the down arrow to see all open pledges for the contact. You can assign the payment to any of the open(pending) pledges. Type: This is the Financial Type and pre-fills when an open pledge is selected. (Payment) Status: This defaults to Completed. Received – Date and Time: This pre-fills with the current date but can be edited. Source: Enter text that describes the source of the payment. Paid by: Enter the payment instrument, e.g. cash, check, EFT, etc. This is a required field. You can enter all transactions for the batch in one session, or simply save the batch and complete the data entry at a later time. If you want to continue entering information into this batch at a later time, click Save & Continue Later. From the menu, click on Contributions > Batch Data Entry then click on Enter Records next to the batch you want. Then continue entering more transactions in the batch. Once you are finished entering payments into a batch, click Validate & Process the Batch. The status of the batch will be set to “Closed” and will available for searches and reporting later. 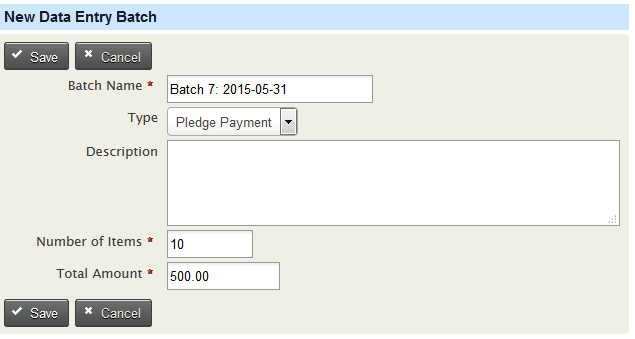 You can continue entering or editing the payments for the batch, then Validate & Process the Batch again. Sadly, some pledges will not come to fruition. To cancel a pledge, find it through a contact or the 'Find Pledges' search tool, use the 'more' link to the right side of the pledge and click 'Cancel'.